Must be viewed to fully appreciate the overall accommodation on offer from this superbly appointed and proportioned three bedroom semi detached family home, which has been reconfigured and refurbished throughout boasting a newly fitted dining kitchen with integrated appliances, newly fitted shower room, as well as re decorated throughout with newly fitted carpets. With the advantage of being positioned on a good sized corner plot, providing the opportunity to extend (subject to necessary consents). 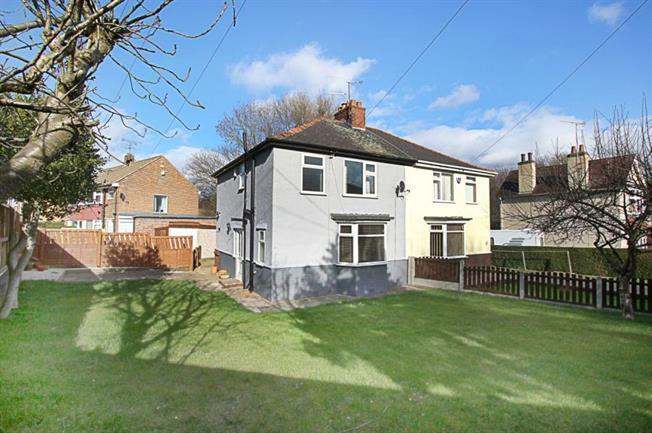 Situated within the popular residential location of Mosborough Village, close by to local amenities, local schools and public transport links. Accommodation in brief comprises: side entrance hallway with tiled floor and stairs rising to the first floor landing, ground floor WC, bay fronted lounge with attractive feature fire surround, coving to ceiling and ceiling rose. Newly fitted dining kitchen with a range of attractive high gloss white wall and base units, integrated appliances to include gas hob, electric oven, extractor fan, dishwasher and fridge, along with space and plumbing for a concealed automatic washing machine. Tiling to the splash backs, laminate to the floor and spot lighting to the ceiling. First floor landing, access to two double bedrooms and single bedroom three, along with newly fitted shower room in brief comprising: wash hand basin, low flush wc and shower enclosure having electric shower within. Tiling to the splash backs, laminate to the floor and extractor fan. Outside: The property is positioned on a larger than average plot providing a lawned garden to the front and side, along with a side patio area, gated access leads to a driveway for two vehicles, garage and low maintenance yard to the rear. Location: Mosborough Village is highly sought after and is popular with buyers of all ages, known for its excellent amenities on the High street, local schools and popular Mosborough Hall. There is a host of gastro style restaurants nearby and Crystal Peaks Shopping Centre and Drakehouse Retail Park offer further facilities. Excellent local walks through the Moss Valley and outdoor pursuits at Rother valley Country Park. Mosborough boasts excellent links to both the M1 Motorway networks and Sheffield City Centre.